Why a ‘Man’s decision’? Because it’s men who should decide what they want for themselves… If you want to get rid of grey hair – just do it. Without looking for reasons and excuses. A well-kept hairstyle is within your reach. If you’re not a fan of grey and silver hair which recently is in the spotlight and your hair needs a pick-me-up – we have a perfect solution for you. We have created a product with an innovative technology that restores the colour of grey hair making it close to natural. 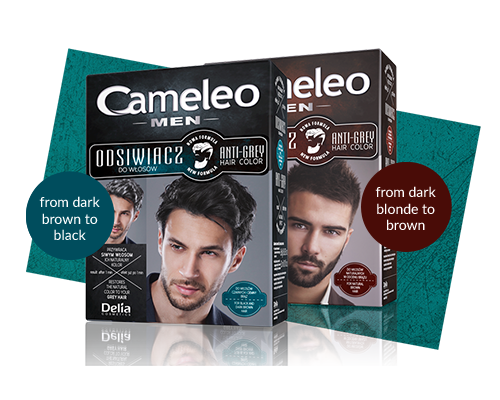 Cameleo Anti Grey Hair Colour for Men is the easiest and fastest way to get rid of grey hair without dying your hair, made to be used at home. This quick and easy treatment will allow you to achieve a lasting and even colour close to your natural hair colour. To do that, our product is available in 2 shades: brown (for brown hair) and black (for black and very dark hair). We guarantee a natural colour without your hair looking dyed thanks to a new formula. The colour stays on until the roots grow back and the hair gets cut. Choose a shade that is closest to you natural hair colour and matches you complexion and eye colour. The black shade is recommended for very dark hair, and the brown shade for hair in all shades of brown. How to colour your hair yourself? Quick results allow for an easy 3-step application. Our anti grey hair colour is extremely easy to use – mix the contents of the sachet with water an apply onto your hair, then leave for a few minutes (read the instructions carefully and stick to the time). After the time is up rinse your hair thoroughly and apply a balm with biotin (included). The balm nourishes, softens and smoothens your hair – your woman will definitely appreciate that! If you need you can also wash your hair with a shampoo and then apply the balm. The last step is drying and styling. All done! Remember no to exceed the time listed in the instruction, otherwise the colour will be darker. Our technology starts working after 1 minute! Our anti-grey hair colour can also be used on beard and moustache. Hence, men who have a few grey hairs here and there can use the product exactly where they want, without doing the whole treatment. Did you know our product can be used twice? One box is enough for two treatments. The box contains two sachets, so if you don’t need a lot, use only one sachet. In the box you will also find biotin balm, gloves, cape and a spatula for mixing and applying. Still not sure that the Cameleo anti-grey hair colour is for you? Make your own man’s decision in accordance with your own needs!